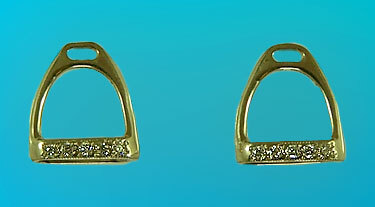 Diamond stirrup jackets, the Gorgeous Horse is your source for custom equestrian jewelry. If you would like to dress up your studs, we recommend these fabulous diamond stirrup jackets. By setting diamonds across the bottom of the shoes we bring your bling to the next level. Stirrups are set with .14ct of diamonds. Also available in sterling silverwith CZ's!